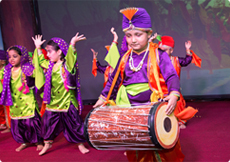 We celebrate all major days and festivals at Bluebells to provide the children with an insight into other cultures. 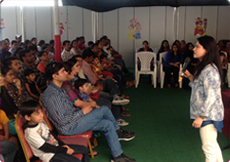 This offers them an opportunity to party with their friends, thus encouraging respect for all and develop social skills. 2013: Bluebellites presented 12 DANCING PRINCESSES. 2014: Bluebellites presented an adaptation of CINDERELLA. 2015: Bluebellites presented PRINCESS AND THE PEA. Held usually in Nov/Dec every year, Sports day is a very important event at Bluebells. A two month practice routine ensure the children get active and encourages them to stay healthy and competitive. A day for the parents to visit their ward’s class teacher and discuss the child’s progress. An extraordinary celebration to wrap up the exciting year the kids had at Bluebells. 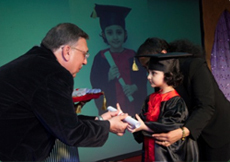 The kids graduate in full graduation robe with certificate, and it is the perfect platform to showcase your child’s talents in a beautifully choreographed Musical Presentation.